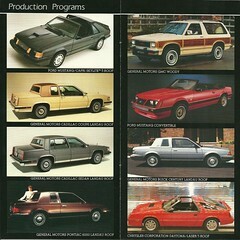 This is scanned from a newspaper ad from 1976 celebrating 50 years of building GM cars in Australia. 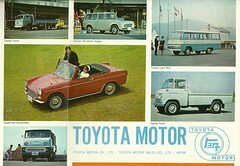 It was a full page and I have only scanned the top half, with the cars built from 1926 to 1968. 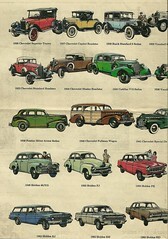 Holden was a busy body maker and there are probably a thousand different models from these years. Though many of the models look like the North American version, all the bodies shown here were made from scratch by Holden in Australia. High import duties on complete cars made body building a big industry. Two of my favorites are the Hurlingham Speedster, which is cut off in the fold at the top, made both as Vauxhall and Chevrolet. Also the fastback coupe in the late thirties known as the Sloper, see the ’37 Chevy example. 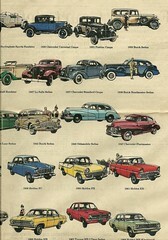 More stuff from my auto sales literature collection. These are models not finished on the assembly line, but sent to Cars and Concepts for installation of equipment. Landau roofs, T-Tops, and in this case – the Mustang convertible. None of these were available in the USA, as far as I know. Some pictures on my computer for several years that I hadn’t put on flickr. Raining heavily, so I’m not going out and shoot today! Some pictures on my computer for several years that I hadn’t put on flickr. Raining heavily, so I’m not going out and shoot today! That’s an Oldsmobile chassis, about 1937, with one of the first Hydra-Matic transmissions. In some ways, the building is the most interesting thing in this shot. First car in stage 4, first day of the Olympic Rally, April 24, 2010 in Grays Harbor County, Washington. First car was a new Ford Fiesta, first one I’ve seen in person, but you can tell I didn’t get a very good look! 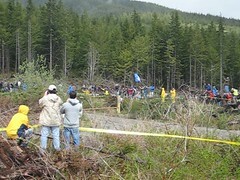 This is where I spent my Saturday afternoon, watching cars run through the muddy forest. On the Rally America circuit, two of them are in my county. Great free entertainment, and you get wet and dirty, too! 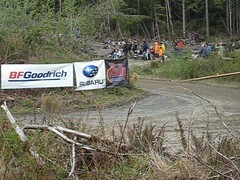 This was near the end of stage 4, where about 40 of the 60 competitors were driving AWD Subarus. Just a few run the classic rally cars, like this.